Shahid Kapoor is one proud dad. And no one will second guess the same. He took time out of his busy schedule to chill with his family this Diwali and made sure that he spends as much time with them as possible, hectic work life not withstanding. 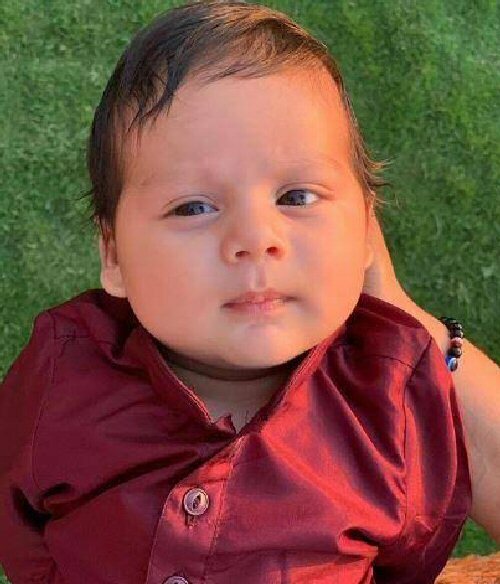 After sharing a few adorable pics with daughter Misha Kapoor, wife Mira and mommy Neelima Azim, Shahid and Mira shared pic of their newborn Zain Kapoor for the first time and we couldn’t help but go all awwww! It’s too early to say who the munchkin looks like but he sure is adorable. One can make out that he wore a red kurta from the picture! Barely a few months old, the camera loves him already and guess, he loves it back! Just a few days ago, Mira had shared one more pic of Misha playing with Zain. We couldn’t see the baby clearly as it was just a sneak peek! Check out the picture of cutie patotie below and tell us what you think. On professional front, Shahid Kapoor has been working on Arjun Reddy’s remake titled Kabir Singh. He will be romancing Kiara Advani in the movie. Shahid has been sporting a beefy look with long hair and mustache for the role and we hope that it would establish him back at the box office, owing to that his last movie Batti Gul Meter Chalu did not do very well!